An ebook is a downloadable version of the book that you can read on your computer or print out. It is fast and does not incur shipping costs. This is the author reading the book. Listen to it on your computer or download it to an MP3 player such as your IPod or mobile phone. 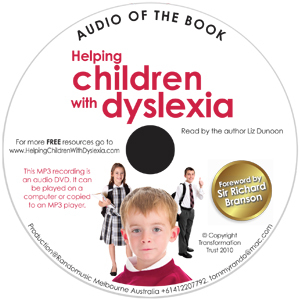 Prefer to listen….to the Audio of the book read by the Author? You can download it from your email inbox and listen to it on your computer or download the audio file to an MP3 player such as your iPod or mobile cell phone. We can send you an MP3 DVD in the post. It can be played on your computer or you can copy it to a device that can play the MP3 recording. This easy to read, easy to understand eBook explains the teaching of reading simply. Learning to read is the same sequential process for all children. Children with dyslexia however, are often slower to learn this process than their peers and as a result they can get left behind with gaps forming in their levels of understanding. Without support these gaps can get bigger as your child grows older and schoolwork becomes harder. This eBook will show you how to identify these learning gaps, provide learning support and will give you 100’s of strategies for the practise of reading in a nurturing home environment to help your child catch up. 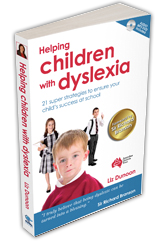 Download this eBook and start to help your child to catch up today. This easy to read, easy to understand eBook explains the teaching of Writing and Spelling simply. A child’s ability to express themselves when writing should never be hindered by a difficulty to spell words accurately. Yet this is often the case. Parents and teachers need to be reminded it is the power of the written word that is important. Many famous and successful people struggle with spelling and this includes prolific authors Agatha Christy, Jane Austin and Shakespeare, among many others. 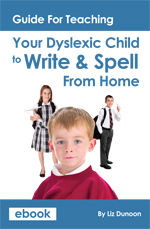 Children with dyslexia are often deterred from writing because of poor spelling skills. 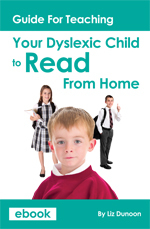 Dyslexia experts give us many reasons why this occurs, yet spelling skills can be taught and this eBook will show you how. You will learn how to teach your son or daughter to decode words and remember them in order to excel at spelling and creative writing. 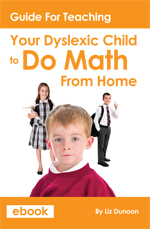 Many children who struggle with dyslexia also struggle with dyscalculia – a difficulty with numbers. You can teach your child to do math. This easy to read, easy to understand eBook explains the teaching of Math simply. Learning math follows the same sequential numerical process for all children. Children with dyscalculia are often slower to learn this process than their peers and as a result they can get left behind with gaps forming in their levels of understanding. Without support these gaps can get bigger as your child grows older and schoolwork becomes harder. This eBook will show you how to identify these learning gaps, provide learning support and will give you 100’s of strategies to teach math in a nurturing home environment to help your child catch up. Click Here to see these options.